Since I've been posting images on Instagram I've received quite a few questions about how I add textures to my work. Its been evolving since last year when I took several Skillshare classes to improve my Ai and PS skills, which were fairly basic. Although the classes were not directly related to what I had in mind ( they were for hand lettering and drawing a character) its been a great spring board for the textural vibe I've always wanted to achieve. This is just a quick run down of the process using the pomegranates from the mulled wine. Most of what I do is trial and error with much use of the comd+z keys. 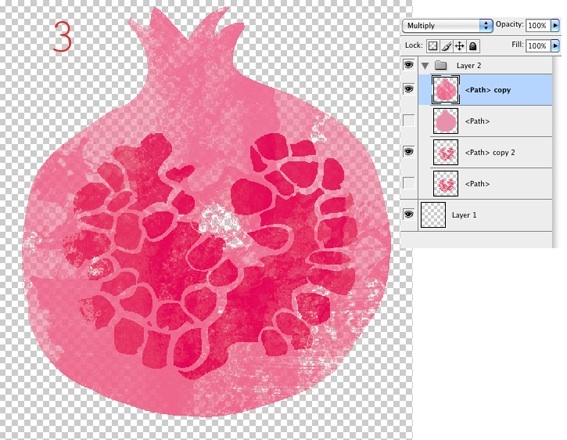 3) In PS use different texture brushes depending on what is desired. Like I said its a learning curve and the more art I do the more i learn - its fun.